The official start of the Way is in Tralee, county town of County Kerry and gateway to the Dingle Peninsula. 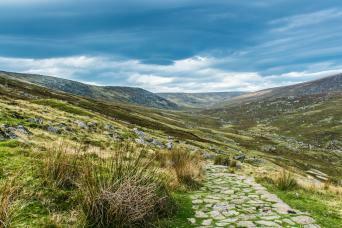 Soon you’ll be striding out across wild moorland cloaked in heather and abundant in wild flowers. Hike past small villages and along coastal routes with truly outstanding golden beaches. Highlights include a stay in the charming town of Dingle and the village of Dunquin, which overlooks the Blasket Islands. See ruined castles and forts, clochans or ‘beehive huts’ which date back to 6000BC and a host of ancient standing stones. A choice of itineraries means you can complete the full trail, a week-long tour, or a shorter 5-night option which takes in the highlights of the Dingle Way. With friendly hosts waiting to greet you at hand-picked accommodation and the ease of luggage transfers each day, this is a classic Irish trail. Arrive in Tralee, the county town of Kerry and the official start of the Dingle Way. Why not visit the impressive Thomas Ashe Memorial Hall where you’ll find the Kerry County Museum and Information Centre. The building was named after Ireland’s first hunger striker who died in 1917 in the struggle for independence. Settle into your welcoming bed and breakfast or guesthouse accommodation. Lace up your boots then follow road and canalside paths, passing by Blennerville windmill; the largest working one of its kind in the British Isles! Then climb up to open moorland and soon cross the flanks of the Slieve Mish range. Here stepping stones have been laid across the typical Irish bog. Admire views across Tralee and towards Mount Brandon in the west as you cross the Finglas River and eventually descend to Camp. On this stage you’ll be walking across moorland and farmland. Caherconree Mountain (835m) with its megalithic fort offers impressive vistas, as you gradually climb out of the valley, crossing a saddle between Corrin and Knockbrack peaks. 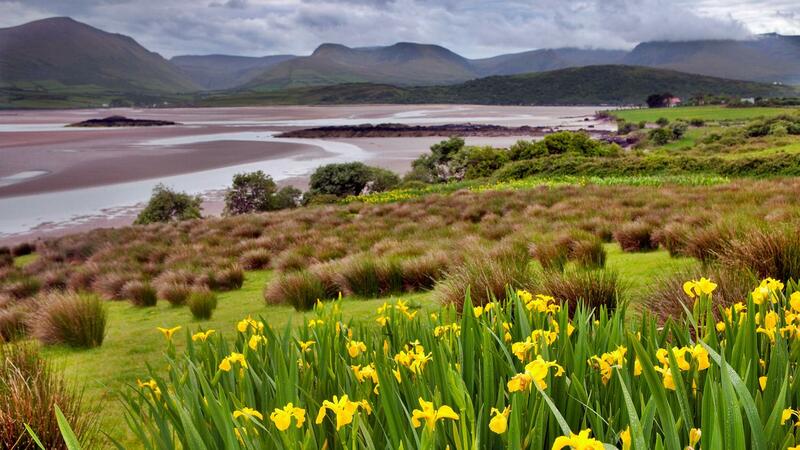 As you descend you may like to take a break at the stunning nature reserve of Inch Beach. 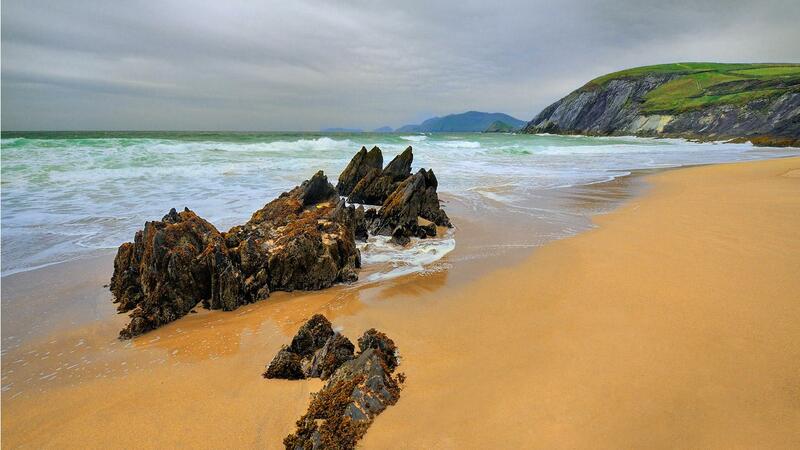 With its crashing waves and pristine beach, Inch Beach featured in the 1960s film Ryan’s Daughter. Make your way along small roads to your overnight stop of Annascaul, birthplace of Antarctic Explorer Tom Crean. Why not reward yourself with a pint in Crean’s pub, the South Pole Inn. From Annascaul you head west, along meandering country roads with views to the Iveragh Peninsula. 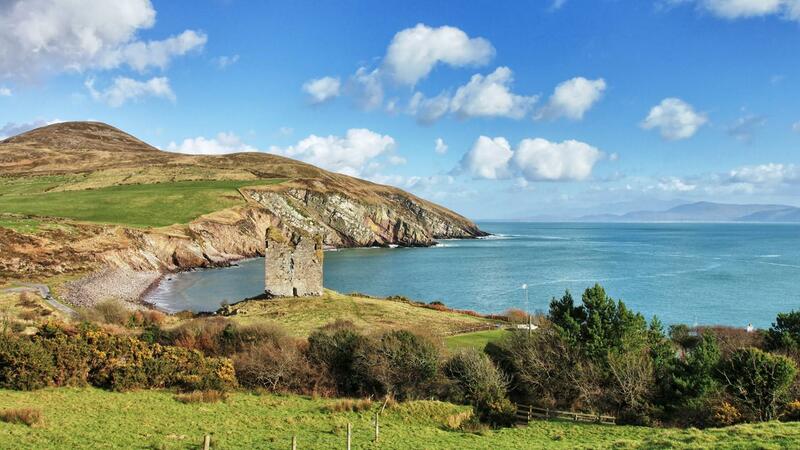 See the 16th century Minard Castle, located in a small sandy cove, the castle was partly destroyed by Cromwell’s men in 1650. Scenic and quiet roads lead inland through farmland to charming Lispole, a good stop for lunch. 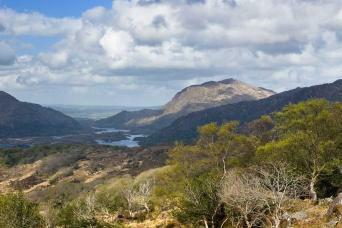 Set off again to the Connor Pass road and enjoy superb wide vistas as you walk down into Dingle itself. The town is renowned for its music, seafood and culture. And with some 53 licensed premises you wont be stuck for somewhere to have a relaxing drink! From Dingle you head further west bringing you through low-lying farmland to the glorious golden sands of Ventry Harbour. After dipping your wearied feet in the turquoise sea head onto the medieval roads of Slea Head. With views over the Atlantic, you may spot the mystical Blasket Islands offshore. 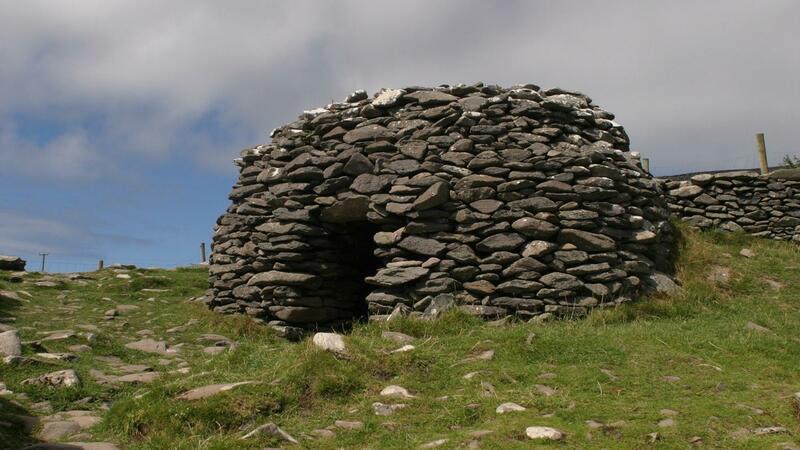 Whilst on the mainland you will see remnants of 2,500 year-old historic forts and clochains—stone beehive huts. Climb up to the shoulder of Mount Eagle. Picture-postcard Dunquin with its pier comes into sight where you will find the nearby Heritage Centre, telling the story of the Blasket Islands. You may wish to consider adding an extra night in Dunquin so you can take the ferry (weather-permitting) to visit Great Blasket for yourself. A great, bracing day’s walking along the coastal paths, with outstanding views to the wild Atlantic Ocean and secluded beaches. Perhaps stop at the workshop of renowned Irish potter Louis Mulcahy at Clothar, where you can enjoy coffee and cake in the café or even try your hand at the craft yourself (open July/August). You will pass by Ferriters Cove and the iconic Three Sisters, before the trail swings east to take you along the sandy beaches of Smerwick Harbour. This is one of the most remote and dramatic sections of the whole walk, and the most challenging as you reach the highest point. The trail offers a combination of history and breath-taking views. You will cross the shoulder of Mount Brandon, one of Ireland’s highest mountains and pass by groups of standing stones. You cross blanket bogs where the turf is still harvested in the traditional way before ending up in the quiet village of Cloghane. Impressive glacial valley views stretch ahead as you stride out of Cloghane. Although the longest stage, you can look forward to extended flat beach walking along the shores of Brandon and Tralee Bays, an absolute joy! 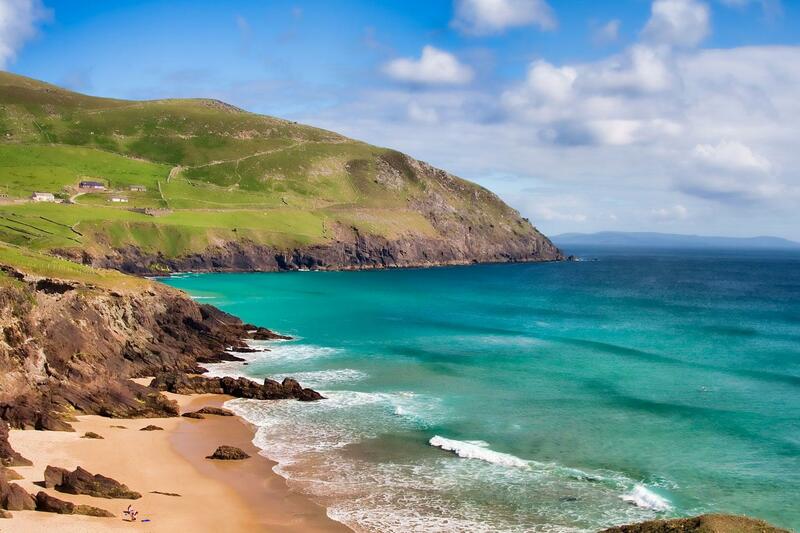 The Dingle Way spans the length of Ireland’s longest beach, Fermoyle Strand, a seemingly endless string of thundering waves crashing onto a fantastic 11km of golden sand and dunes. Reaching the head of the strand, the trail curves around Scraggane Bay to the north before returning down the eastern side of the loop and along the road to Castlegregory. Keep a look out for remnants of turf cutting as you walk through a flat area of bogland before following another 7km stretch of coastline along the seashore to Camp. Buses run from Camp to Tralee (25 mins). Return to the lower slopes of the Slieve Mish mountain range, retracing the start of the walk as you stroll through the open rolling terrain. A canal path leads back to Kerry’s capital, Tralee. We offer three itineraries; all operate in the traditional direction, which is clockwise onwards from Camp. Our itinerary choices take into consideration the most conveniently placed overnight stops. One of the highlights of this tour is the high standard of the accommodation. We specifically choose the hotels, inns, guesthouses and B&B’s to ensure that you enjoy every minute of your stay. They all offer a warm welcome to walkers, traditional hospitality and delicious local food. Below you'll find a sample selection of the types of accommodation that we commonly use; please note that they are all subject to availability. The Park features beautiful high ceilings and has retained many of its Georgian features. It has a mix of individually styled rooms, juxtaposing old elegance with contemporary luxury. The Camp Junction House is a B&B, with two additional apartments. 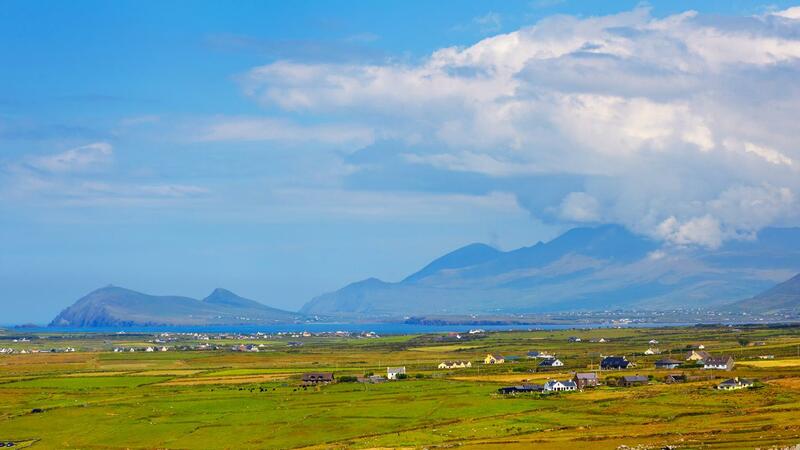 It has panoramic views of Tralee Bay and Slieve Mish Mountains. Annascaul House is a family-run B&B situated in the heart of Annascaul village. The 4 ensuite rooms are equipped with tea & coffee making facilities, as well as TV, hairdryer, and fluffy white towels. 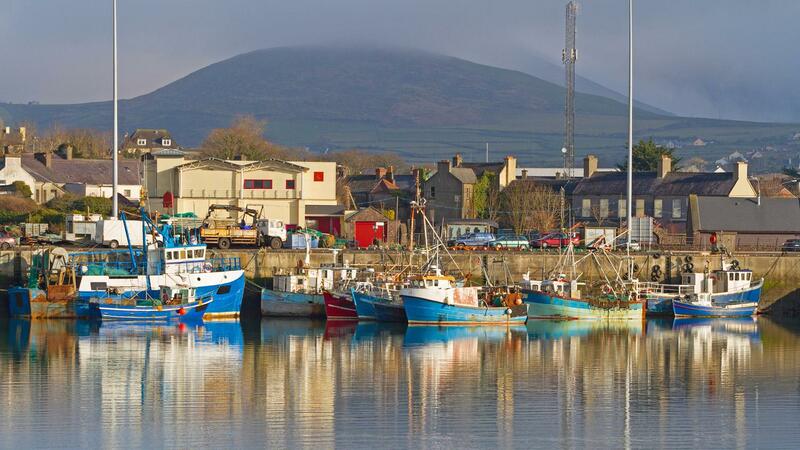 O’Neill’s is centrally located in Dingle town and yet secluded from the busier tourist areas. Mary and Stephen have welcomed guests to their B&B and offer a wonderful breakast. This B&B was originally built as a farmhouse in 1938. Located at the very tip of the peninsula, it enjoys spectacular views of the Blasket Islands and has been recently renovated to modern standards. The rooms in this lovely B&B are individually and tastefully decorated. The Begley family at An Riasc are an Irish speaking household and will happily help you learn a cúpla focal (a few words) if you wish! Claire and Elizabeth offer you a warm welcome to their family run spacious and modern guest house, with wonderful sea views. The breakfast menu includes homemade breads and preserves and traditional Irish Breakfast. This guest house is set in 11 acres and is just a short distance away from the beach. The Dingle Way passes the boundary of the garden. You can also enjoy complimentary tea/coffee, and scone on arrival. Due the route taken by the Dingle Way, it is sometimes necessary to accommodate you a short walk away from the trail itself, as there is not always suitable accommodation close to the trail. Details will again be given on your accommodation sheet. A hearty breakfast is included each morning. Lunch and dinner are not included so you are free to choose from the available options. Most of your accommodations will be more than happy to provide a packed lunch on request and this can be booked on arrival. Alternatively you can buy lunch at local shops or stop in a café. The Dingle Way is available from March to October. You can start your trip on any date in the season. Option prices will be displayed as part of the booking process. A hearty breakfast is included each morning. Lunch and dinner are not included so you are free to choose from the available options. Most of your accommodations will be more than happy to provide a packed lunch on request and this can be booked on arrival. Alternatively you can buy lunch at local shops or stop in a café when available. The distances and ascent / descents are approximations of the recommended routes. Please be prepared by packing all necessary items, for example, proper rain gear (jacket and pants), sun hat and sunscreen. Your information pack has a detailed equipment list which includes standard walking gear such as good walking boots or shoes, warm and waterproof clothes for the cooler months and lightweight clothing for summer, and a day pack. The Dingle Way is well way market throughout the route. You will also be provided with detailed maps and guide book. 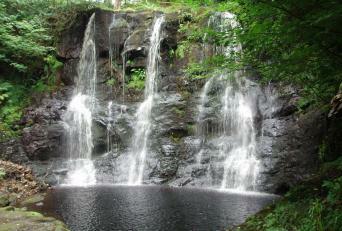 Our itineraries are graded moderate and are suitable for regular walkers. Most days offer between 6—8 hours of walking on good terrain which may include forest tracks, board walks and minor roads. The Dingle Way does not go any higher than 650m (the ascent over a spur of Mount Brandon), and elsewhere the route never rises above 350m, so it is comparatively low-level, however is undulating. The Way uses a variety of routes throughout its length. Several beaches provide great walking (about 17% of the Way), however overall about 48% of it follows tarmac (bitumen) roads, although you will have covered nearly half of this upon reaching Dingle. This reflects the fact that rights of way are almost non-existent in Ireland, and this in common with other Irish trails. The road walking is scenic and mostly along quiet lanes, however there are from time to time some busier stretches where you will need to be cautious with traffic. Shannon Airport: Flights are available to Shannon Airport with Aer Lingus from Dublin, Bristol, Manchester, London Heathrow and Birmingham, as well as Boston and New York JFK. Ryanair fly to Shannon from Liverpool and London Stansted. Air Transat fly from Toronto to Shannon. From Shannon Airport take a bus (approx. 2h50-3h15, via Cork) to Tralee. By Bus around Dingle Peninsula: From Camp to Tralee and vice-versa there is a bus service, which takes approx. 25 mins. From Tralee to Annascaul there is also a bus service, which takes approx. 55 mins. Buses are payable locally. See www.buseireann.ie. 5, 7 or 9 Nights accommodation in hand picked B&B's, guesthouses and small hotels in en suite rooms wherever possible. A detailed info pack, guide book with route notes and OSI maps. (5 and 7 Night itinerary only) Transfer from Cloghane to Tralee. 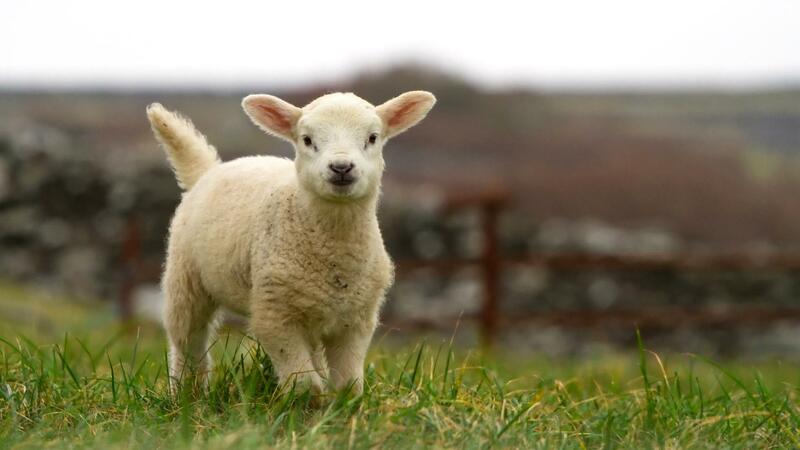 Travel to Tralee (and Annascaul for 6 day tour) and from Tralee. Single Room Supplement or Solo Walker Supplement (as applicable). Extra nights before, after or during your walk. Baggage Transfers - how does it work? What's the grading of this tour? This route is well way-marked and much of it does follows a path. It is always advisable that you are know how to navigate with a map and compass although the Way is largely very straightforward to follow, especially with the maps book and guidebook we provide. Our itineraries operate in the traditional direction, which is clockwise onwards from Camp. Should you wish to tailor-make your tour then please let us know, however bear in mind that the guidebook operates in the aforementioned direction. Our itinerary choices take into consideration the most conveniently placed overnight stops. From the very beginning of deciding to walk The Dingle Way, MacsAdventure made me feel confident of my choice of hiking adventuree. My conversations with representatives were filled with beneficial information and suggestions for how to best make choices to achieve my goal. The materials for the hike were so informative I had no doubt about my choice of hikes. I highly recommend using MacsAdventure for your own adventure. This was an idea way to see the countryside. We loved the changing terrain, across farmlands where we saw sheep, cattle and horses, up mountains and along beautiful beaches. Our BnBs were excellent and particular mention should be made of Castle House in Castlegregory. We arrived after walking 31Km in the pouring rain and she took us in like a Den Mother. She dried our clothes, put our shoes by the fire and brought us tea. Her home was lovely and we never wanted to leave. We were a party of 4 retirees who enjoy walking. The Dingle Way is a moderate hike along roads, beaches, country side with some of the most beautiful scenery we have seen in our travels. Be prepared for rain after all it is Ireland. We did have a full day in the rain and likewise lots of sun. But even in the rain, it was beautiful. The accommodations were as expected, very good. And breakfasts were all you could eat! We recommend downloading the maps on the iphone as it made it easy to follow the trail, which is well marked as well. The tour was well organized. The B&Bs were all wonderful and the hosts and hostesses very helpful. The baggage service went without a hitch. The long walks on the beaches were spectacular. The app with the maps was brilliant. We could track our progress with every step and see when we were headed off the trail. We didnt have to rely on paper maps or directions at all. The only negative is that sometimes the difficulty rating was not accurate. One section labeled difficult was not difficult and another section labeled easy had some long steep rocky climbs. Notes about whether there are food and public bathrooms would have helped. We carried snacks every day but better notes about food shops and pubs open for lunch would have been nice. The Dingle Way is ideally suited for those who like distance walking without it being too strenuous. Each day is about 12-14 miles and, except for the last day where there is a prolonged and steep (600 metres) ascent, the terrain is relatively straightforward. Being Ireland the weather is inevitably changeable but if you get half-decent weather the scenery is outstanding. All of the accommodation was very good and in many cases was outstanding. We met so many friendly and helpful people along the way - indeed that perhaps is the thing that will linger for longest. Walking is a wonderful way to holiday. And Mac's made this so easy. 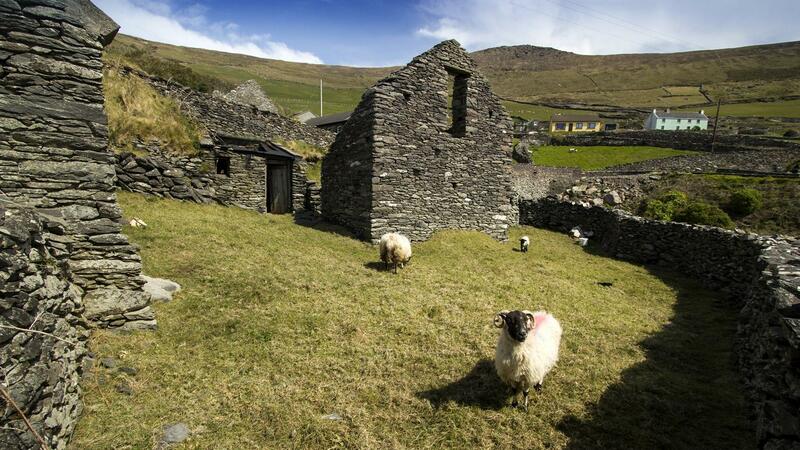 The Dingle Way is a bracing cliff-top walk in one of the most stunning, historic and remote parts of Europe. With its well way-marked path, unforgettable scenery and welcoming people, the Dingle Peninsula is a great place to forget about the worries of modern life.